This is a follow-on to yesterday’s post. 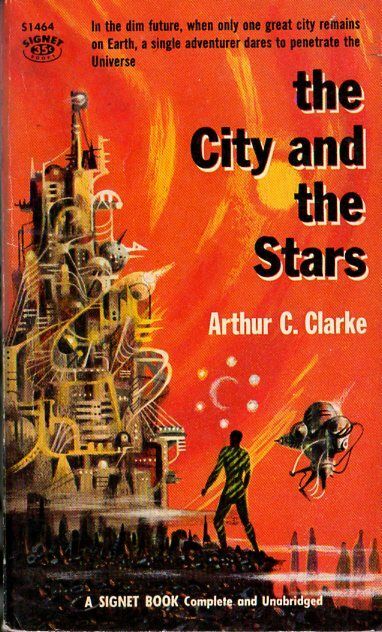 There is an intellectual challenge in comparing Clarke’s Against the Fall of Night to his The City and the Stars. I could easily see someone writing a thesis in an English Literature program comparing the two in great detail. That would certainly make more sense that a thousandth thesis on Joyce’s Ulysses. Clarke’s first version of the work, written, published, and praised, just wouldn’t let go of his mind. I get that; it happen to me twice. (The won’t let go part, not the published and praised part.) My second serious novel, Valley of the Menhir, came to me as a fragment and grew piecemeal over four decades. Cyan rolled along smoothly, and was almost finished (at about half it’s present length) when I ran into a problem I couldn’t solve without destroying the basic structure of the book. It sat in manuscript for years before I realized a way out of my dilemma. Of course Against the Fall of Night was already out there, but the idea that a book could nag at a writer for years and finally cause a rewrite — even after it was published — makes perfect sense to me. Truthfully, however, these two novels are the same story. Clarke would not agree, but I think he stood too close to both his works to judge. There are differences between the two, of course, and Clarke considered them significant. They don’t seem so to me. Between 1937 and 1946, at least five versions, of ever increasing length, were developed.
. . . undoubtedly, much of the emotional basis came from my transplantation from the country (Somerset) to the city (London), when I joined the British Civil Service in 1936. The conflict between a pastoral and an urban way of life has haunted me ever since. Many people before Clarke had written to that theme without creating anything as lasting as the city Diaspar. Many people after Clarke recycled Diaspar, under many names in many novels. The movie Logan’s Run comes to mind. Yesterday I spent an hour in a local used bookstore and saw several forgettable (and actually forgotten) novels where the hero escapes from or is exiled from a sealed city and finds himself in a sylvan, or at least archaic, world. Diaspar, glorious as it is in Clarke’s description, had stood for billions of years and then was utterly changed by one young man is what appears to be about a year. Such an effortless transition has neither resonance nor believability. What Alvin does is powerful and meaningful, and Clarke’s creation of Diaspar, Lys, the Seven Suns, and Vanamonde is worthy of praise. But the changes that happen come too easily for full satisfaction as a novel. Both versions of the story of Diaspar were great books for their time. Nevertheless, a modern reader encountering them today might shrug and say, “This is all old stuff. I’ve seen all this before.” He would not realize that these two novels, through their many imitators, are the reason the ideas seem familiar. This all reminds me of Jekyll and Hyde. Almost no one has read the original, unless forced to in a literature class, but everyone knows the story. So which is great — the imitators everyone has seen, or the original everyone has forgotten? This entry was posted in A Writing Life and tagged Arthur C. Clarke, memoir, science fiction, writing on April 11, 2017 by sydlogsdon.